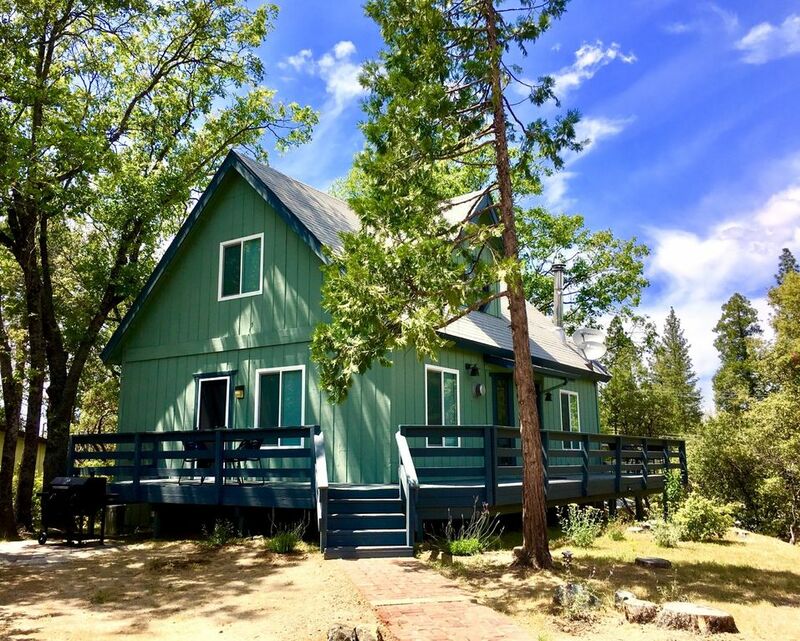 Come enjoy this adorable two story retreat only 1 mile from Bass Lake and 18 miles from the south gate of Yosemite National Park. You can walk to the Lake down an interpretive trail with stunning views or drive down in a few minutes. Goat mountain mountain bike trails are accessible from the cabin. This home is an excellent base camp for hiking, trail running, road running, mountain/road biking and back country exploration. The home features a quiet neighborhood, beautiful mountain views and updated furnishings. Enjoy wi-fi, large TV with cable, DVD player, wood-burning stove, air conditioning and heating. 6 miles from Oakhurst. The master has a king bed, ceiling fan, sliding doors, balcony and unique skylight. The second bedroom has 1 queen and 1 twin XL bed, also with a unique skylight. The living room features two full couches, one with a queen memory foam sleeper, 55 in TV with cable and wi-fi. Both bathrooms have a tub/shower combo and single vanity with ample counter space. Liquid hand soap, bath soap, hair dryer, and towels provided. The dining area has a large table, ceiling fan, and wood burning stove. Kitchen is fully stocked and includes coffee maker, Keurig pod brewer, tea kettle, coffee and tea. Both bedrooms and one bath are accessible via spiral staircase. Sofa sleeper, living room, kitchen, second bath and dining are all on lower level. Books, games and extra blankets throughout for optimal relaxation! One bathroom is upstairs and one downstairs. Both feature ample counter space and updated shower heads. Split unit air conditioner in each bedroom and downstairs living area. Split unit heating in each bedroom and downstairs living area. Sheets and blankets provided for all beds. Covered parking for two vehicles. Wood stove downstairs in dining area. Two full sized couches, one with queen sleeper plus ottoman. Television with cable and sound bar also in living room. Beautiful, extra quiet dish washer. Full size with ice maker and water dispenser. Paper towels, salt and pepper, coffee, tea, sugar packets, spice rack, provided. Dining table with six stools. Two additional stools at breakfast bar. Table can fold out to accommodate eight. Dining area with ceiling fan and wood burning stove. Upstairs Master has a balcony with table and two chairs. Small wrap around deck with seating. Small balcony also with seating off the master. Paver patio with BBQ. Four stairs to access front door and spiral staircase to access upstairs bedrooms. There is a sleeper sofa and bathroom downstairs for individuals who cannot use spiral staircase. Water sport equipment can be rented during the summer at the Forks on Bass Lake (1-mile walk down trail). Please feel free to ask hosts for help planning your outdoor adventures! Super cute, clean, and cozy! It was very homie! All the essentials was provided including wedding, kitchen supplies, and bathroom supplies. We loved the view! Even my toddler was saying he wants to go back. Will be definitely do again! The home was simply satisfying, comfortable, beautiful and had a nice view highly recommended! Such a great first experience in California. The location of this house is great, close enough to town but far enough out to be peaceful. The place was very clean and had everything we needed. We would definitely stay here again! We thoroughly enjoyed our stay! Gorgeous views and yet close enough to get to a grocery or to Yosemite. Owners were very responsive with the few questions we had. The coffee and just extra supplies that aren't at every rental made this one stand out. All the hikes they recommended in Yosemite we ended up doing and even doing lots of research beforehand, their advice was solid. Thank you! Amie and James have done a wonderful job of creating a warm and inviting cabin for their guests. The cabin is very spacious and feels very home-like. After long days of enjoying all the sites at Yosemite or Bass Lake, the cabin was such a nice place to rest and relax while still enjoying a beautiful view! We truly enjoyed being able to cook meals (we even used the grill) and enjoy them as a family around the big table. With teenage triplets it’s important to have space...this cabin was perfect for everyone! The satellite tv and WiFi were a huge bonus as well! Thank you Amie and James for a wonderful stay. All of your thoughtful tips in your welcome folder were great! We will definitely be recommending your cabin to all of our traveling friends! Mahalo nui loa! Thank you for your kind words. Please come stay with us again anytime. We are happy to be part of your Yosemite visit. You were excellent guests! Great furnishings. Good location. Good views. Would recommend. We stayed for the purpose of exploring Yosemite and Sequoia National parks. The home is located 1 mile from Bass Lake which offers a variety of watersport rentals during the summer as well as hiking and mountain bike trails. The neighborhood borders National Forest land, so trails are accessible from the home. Bass Lake is also a popular road bike, running and triathlon destination. The town of Bass Lake offers a variety of amenities including restaurants, a bar, small grocery store and gas station. The home is located 6 miles from the town of Oakhurst, which is a much larger town. It has a cinema, live theatre, two grocery stores, antique shops, bike rentals, gas, laundromat, numerous restaurants, etc. From the home, it is a short drive to lots of backcountry trails in Forest, National Park and Wilderness areas. Trails through Giant Sequoias of Nelder Grove are a short drive away. It is 18 miles from the south entrance to Yosemite National Park which is home to Yosemite Ski Area (previously Badger Pass). Yosemite Ski area offers 5 lifts for ski and snowboarding. There are also miles of cross country ski and snowshoe trails are accessible from Badger during the winter as well as downhill and cross country ski and snowshoe rental. There are sled rides and horseback riding at Yosemite Sleigh and Trail rides out of Fish Camp also. The old Sugar Pine Railroad is also very interesting.